My unedited interview with Jeff Yang, prominent writer for the Wall Street Journal as well as author and advocate for Asian Americans. For more from the Disney Nerds blog, sign up to receive the latest updates via email. 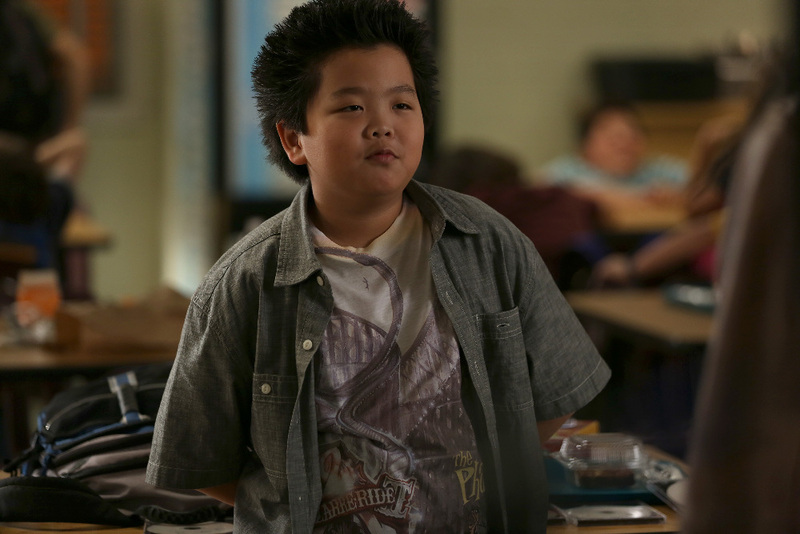 To read my piece on Asian-American stereotypes that Fresh Off the Boat is changing, go to Babble.com and enjoy the piece. Let me know what you think! Thank you so much Jeff for taking the time to answer a few questions! I really appreciate it. Reading some of your pieces, you are obviously involved in Hudson’s career and active in helping him navigate the waters of Hollywood. Yet you’ve also got a career of your own that is very prominent. How do you find time to balance both your career and being Hudson’s dad? Have you had to make sacrifices to do both and do it well? It’s been a tough juggle, I have to admit! None of us were quite prepared for this happening — Hudson had never expressed any interest in acting until he came home one day and announced he wanted to try it. So when I took him to his first audition, it was an attempt to show him how hard it was to be a working actor and how it often involves crushing disappointment. I mean, most of the best actors I know are also the best bartenders and waiters, you know? But he ended up almost getting cast as the co-lead of the film he auditioned for that first time — they flew him and me out to L.A. for a screen test! — and when they picked the other kid because Hudson had, literally, no experience, the casting director told me that he should keep doing it, and introduced Hudson to his agent. Since then it’s been a whirlwind. I had to spend four months in L.A. with him while he shot this first season — I’m glad that my editors are open-minded people. Being in the public eye is something you are used to, but I imagine having your son out there must be a completely different experience. How do you react to negative criticism of the show and of your son? In what ways, if any, do you try to protect him from it? It’s tough. I have been especially conscious of social media and how dark and ugly it can be to those who are in the public spotlight. People forget that there’s a person behind the handle or the update — they’ll say things without knowing the impact on the people reading them. I kept Hudson away from Twitter for months because of the craziness that kept erupting around the show during its runup, from the reactions to the name, to the aftermath of Randall’s starring in the Interview, to Eddie’s public critique of the show — which was meant to be a challenge, not a condemnation — to the bizarre question asked at about chopsticks at the Television Critics Association. Even so, he asked me whether it was true that “Fresh Off the Boat” was “racist,” based on a tweet that he’d read over my shoulder. It wasn’t until the episodes started airing and the conversation started being more about the show and less about the sideshow, so to speak, that I felt comfortable talking him through the criticism.. I thought it was important for him to understand the issues people were raising, because some were quite valid — and yet, based on not having seen more than a few minutes of footage. Having the actual show out there really started to swing the balance of opinion and give people some insight into what its creators were trying to do — something far more clever, disruptive and even nuanced than the early take on the show had assumed. Hopefully, this show will last for many years, but even if it doesn’t having been only the third show to feature Asian-Americans and the first in 20 years means that Hudson’s life has already been changed. How do you keep him grounded and rooted considering the impact this show will have on his life, not only as a TV star but as a forerunner for other Asian-Americans? Well, he still has to do his homework, not fight with his brother and go to bed on time! To be honest I’m not sure he’s really fully come to terms with the larger context of the show and its importance. He lives in a world that’s very different from the one we grew up in — it’s one in which being Asian doesn’t have quite the same stigma that it did for me, as one of the few nonwhite kids growing up in the white middle-class suburbs. In fact, being Asian is kind of aspirational for a lot of the kids his age, who’ve basically been weaned on Yu-Gi-Oh and Nintendo and anime and sushi and dim sum. At the same time, he’s actually getting stopped and recognized on the street now. He still doesn’t find that annoying — he’s shocked when people ask him if he’s “that kid on that show” — but I’m sure it’s just a matter of time, ha. That said, it helps a lot that the other castmembers are so incredibly cool and supportive. He and Forrest and Ian are close friends, and Randall and Constance couldn’t be better screen parents and on-stage mentors. It’s still a huge adjustment for a kid who’s never done this before to make…but it’s always easier to do it when you’re surrounded by good people. Having an extensive knowledge about the industry, was there ever a time you considered not having Hudson take the role? If so, what convinced you to overcome those doubts? If not, what was the overriding factor in that decision? I honestly told him that he had to be sure what he was doing. This is a hard job — it has some great perks obviously, but you’re doing 10 hour days, five days a week, which includes three hours of school and lots of frustrating and repetitive and boring stuff. And of course, if you do it, your entire world changes, in both good and bad ways. Can you move away from the city in which you grew up and away from the friends and extended family you love? Can you live under a microscope and deal with attention all the time, without having it change your personality in really bad ways? An 11 year old kid can’t necessarily answer all of these questions, but you need to know that there’s a real passion and desire to do this, that it’s not just a whim. In Hudson’s case, he really wanted to give this a shot. And when he said that, I told him what I always told him: If you’re going to do it, you have to do your best. You have to realize that there will be sacrifices and hard work. And if you decide you don’t want to do it after you’re in the middle of it, I’ll move mountains to get you out…but you have to know, there really is no going back. You decide to do it, you do your best, and when you decide not to, it’s back to the regular world…people don’t usually get second chances in this business. We talked for a long, long time. And he said he wanted to do it. And here we are. What advice would you give to parents who are thinking about having their children enter into the entertainment industry? What about the experience having been the parent of a child who is now a star of a TV show would you share with them? I’ll just say this: It has to be what your child wants, not what you want. It’s not an easy journey, and there are so many ways in which it can be a terrible one for both parent and child. But if your kid has a gift and the passion to really commit to this kind of a career — well, you have to support that! So many parents, especially Asian American parents, discourage creative pursuits because they think they’re difficult and unstable. And they’re not wrong. But that doesn’t mean you should crush your kids’ dreams in favor of something that offers more guaranteed returns. We need more Asian American actors, more writers, more filmmakers and musicians out there. That’s not going to happen if Asian parents don’t support talented Asian kids with dreams. But it’s not an easy ride. And nothing’s harder — or more important — than giving your performing son or daughter a warm, safe, low-stress environment to come home to, after the lights go out. Is it at all strange for Hudson to have two families – one on screen and one off screen? How has this experience been for you and your wife? Has this been an easy experience for her? It’s not at all strange! Randall and Constance and the boys have been so welcoming of Hudson, and given him so much support and inspiration. The harder part this past season was on our own family. My wife and I are divorced — amicably — but it’s very important to both of us that the kids have the opportunity to spend quality time with both parents, and especially that Hudson and his little brother Skyler get to spend time together — they are inseparable. And yet, they did have to be separated, for four months, because Skyler was in school still and Hudson was shooting the show, so Skyler was in New York with his mom and I was in LA with Hudson. Regular FaceTime chats and visits whenever the show was on hiatus helped, but it was still very tough. We have committed to both of us moving to LA if — when — the show gets picked up for another season, to prevent that from happening again. How is Hudson’s view of Asian-Americans today different from your view when you were his age? Is there any aspect of the Asian-American experience you hope they tackle on the show that hasn’t come up yet? I’ll tackle the second part first: The show needs to tackle the fact that Asian America is a diverse community — the Huangs and their relatives are basically the only Asian family we see. Next season, I hope they encounter Asians of other ethnicities. They shouldn’t bear the sole burden of representing all of Asian America! As for the first question: The biggest thing that is different about Hudson’s view of Asian Americans, and I think this is true for a lot of kids his age, is that he’s totally comfortable with being Asian American! He doesn’t stress out about it, and he’s both proud and confident about his identity in a way I never could be. It’s what gives him his swag on camera, ha. But it’s also the fundamental sea change that has allowed Fresh Off The Boat to happen: Asian Americans have established ourselves in the culture, society and business of this nation in a way that makes it hard to be dismissed as foreigners and outsiders, the way that prior generations have been. Asian American kids still face racism — let’s be real here — but there are so many more resources, role models and support networks now than there were when I was growing up. And I’m hoping that Fresh Off The Boat will become one of those resources, reshaping the ways that Asians are looked at by the generations who come after us. That’s kind of my way of saying I hope this show sticks around for a long time. Thank you so much for your time, Jeff. I’ve been reading some of your other articles about the show and found your insight to be touching and deep. In particular your piece in The Los Angeles Times hit home for me so thank you. I really appreciate the time you’ve taken from your busy schedule to answer these questions. Best wishes to your family!